NASA’s latest moon mission ended last Monday—not with a whimper, but a splat. Ebb and Flow, two space probes the size of washing machines that have been orbiting the moon and measuring its gravity field, performed an orchestrated death plunge, crashing into the body’s dark side. The exercise was not for the advance of science, but rather something of a garbage-disposal operation, to make sure that the probes—which are running out of fuel—do not come to rest in a historically significant place, like on Neil Armstrong’s footprints. At the moment it is a faint object, visible only in sophisticated telescopes as a point of light moving slowly against the background stars. It doesn’t seem much – a frozen chunk of rock and ice – one of many moving in the depths of space. But this one is being tracked with eager anticipation by astronomers from around the world, and in a year everyone could know its name. Comet Ison could draw millions out into the dark to witness what could be the brightest comet seen in many generations – brighter even than the full Moon. 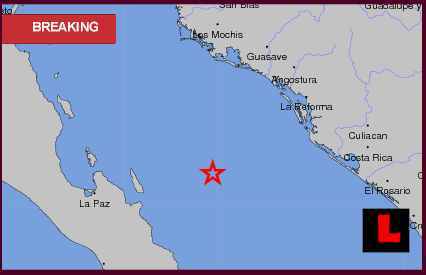 LOS ANGELES (LALATE) – A strong Mexico earthquake has erupted today. A terremoto en Mexico hoy, Thursday, December 27, 2012, began in the predawn morning hours centered in Baja California. The quake marks one of the strongest Mexico temblors to strike this December. No reports of damage have yet to be indicated by local news. Officials tell news that a 4.7 magnitude Mexico earthquake erupted Thursday at 6:05 am local time. The quake, while strong, also posted a shallow epicenter. USGS indicates to news the Mexico earthquake erupted six miles below sea level in the Gulf of California, off the east coast of Baja California. The quake, however, could be felt to the west on the Baja peninsula.